Inhibition of p21 expression by RNAi. (A) Inhibition of p21 mRNA expression by RNAi. p21 mRNA levels were decreased after transfection of chemically synthesized siRNA (Si-1, Si-2) or cell-expressed shRNA (p2.3, p3.2) specific for p21. 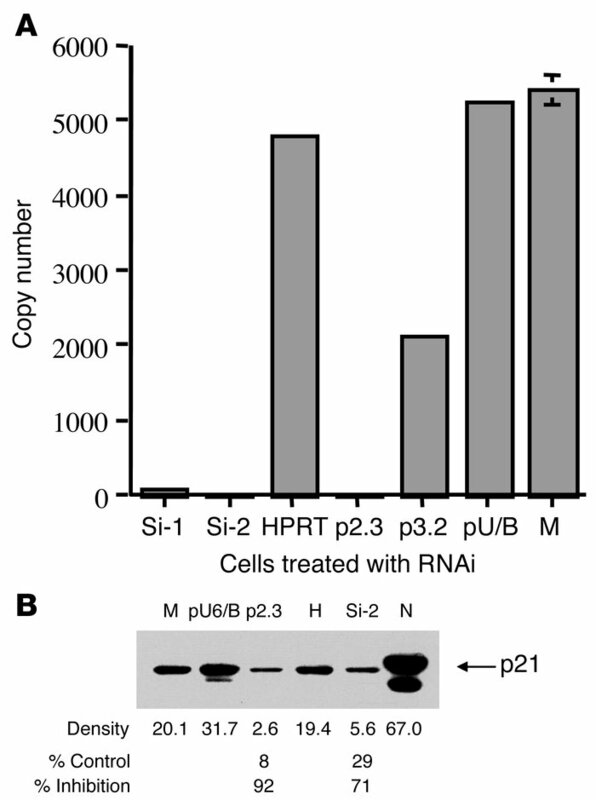 The decrease of p21 mRNA did not occur in control cells treated with siRNA specific for hypoxanthine phosphoribosyl transferase (HPRT) or vector only (pU/B) or mock-treated cells (M) (or a mutated form of Si-2, shown in ref. 15). RNA copy number in 50 ng of total cellular RNA was detected by TaqMan real-time RT-PCR assay (Supplemental Figure 1) performed in quadruplicate. Error bars are not visible when the SD is less than 2.0%. (B) Inhibition of p21 expression with p21 siRNA examined by Western blot. The same cell aliquots used in A were examined for p21 protein expression after RNAi treatment. M, p21 protein detected in cells mock treated with siRNA; pU6/B, treated with vector only; p2.3, treated with p21 shRNA; H, treated with HPRT siRNA; and Si-2, treated with p21 siRNA. N, nuclear extract of p21 protein served as a positive control. *Percentage of control was calculated by comparing the densitometer readings of p2.3 with pU6/8 (8%) and Si-2 with H (29%). Results are representative of 3 independent experiments.